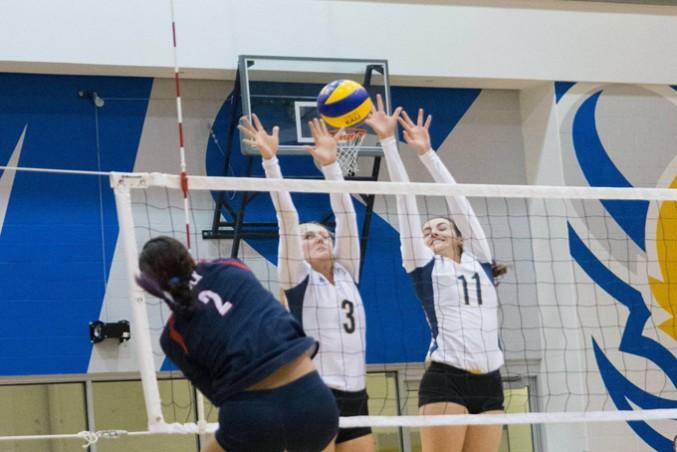 For the first since their 2001-2002 season, the Ryerson Rams women’s volleyball team secured an Ontario University Athletics (OUA) silver medal, losing to the University of Toronto Varsity Blues in straight sets at the OUA championship game Saturday night at the Goldring centre. After coming off a Friday night game that saw Ryerson handedly defeat the University of Western in straights sets, the Rams battled all night against the undefeated Blues, who showed why they’ve been so dominant all season long. In a game that saw the lead change hands numerous times, the Rams came out ready to play, with two straight kills from outside hitter and first team OUA all-star Veronica Livingston putting the Rams up 10-7. But as the Blues have been showing all season, they’re not a team to settle on as Toronto carried a 16-14 lead into the first technical timeout. Despite Livingston’s game high six kills the Blues took the first set 25-20. The second set saw both teams jockeying with a back and forth one point lead with middle blocker Jena Bonello shutting down Toronto’s Annie Feore to put the Rams up 6-5 early. After a quick timeout, the Rams came out swinging, stringing together four quick points to get ahead 11-10 forcing the Blues to take a timeout. Yet leading into the second break, the blues carried a 16-15 lead. And despite the strong play by the Rams, Toronto would take the second set 25-20, with momentum on their side heading into the third and final set. It was outside hitter Sam Gill who got things started for the Rams in third, putting together three straight kills to put the Rams within one 6-5. But it was all Blues from there, going on six point run to put them 12-6 trying to push for the homecourt sweep and an appearance in the CIS championships. And despite sitting Livingston due to unforced errors, the Rams never say die attitude was on full display. Even when the Blues were a single point from OUA gold, the Rams making them work for it, scoring three points before Toronto finally secured their victory. Coming away with a silver medal, Veronica Livingston, Theanna Vernon and Emily Betteridge all earned first and second team OUA all-star honours, while Rams newcomer Kate Mcllmoyle earned all-rookie selection.